had to pin this for later! these sound awesome and look sooo good! syrup and brown sugar sound like it makes a great topping to these too! Absolutely! It’s just nice and syrupy and sweet. The kids downed it! Let me know if you try it…I love feedback! Thanks so much Lynn! If you do give them a try, please let me know what you think 😀 Have a great week! 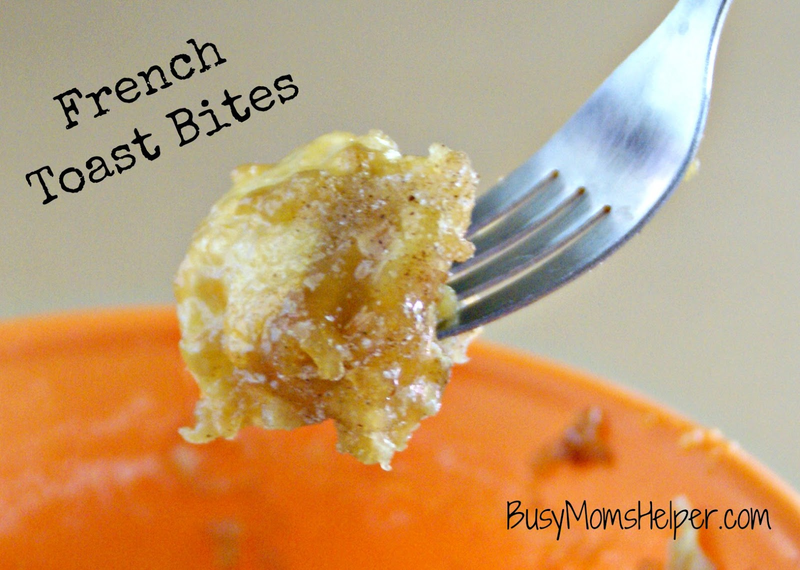 We love french toast and these seem really easy to make! This would be perfect for toddlers. Absolutely! My almost 2 year old and twin 3 year olds just LOVED these. 😀 Hope your week is fantastic! One of my boys hates eggs so he won’t even try french toast, these look like he’d love them though!! Can’t wait to try them. Oh ya, it sounds like these would be just perfect for him! It’s cute that he’s so strict on ‘no eggs’ 🙂 Thanks so much for stopping by! Thanks so much for the invite, Cathy! I’ve got it added to my calendar, and got all linked up with some of this week’s posts 😀 Hope you have a fantastic weekend! I’ve never seen something like this before. I’m with you on the maple syrup thing. So, I might need to give this a try. Thanks for the idea. Thanks KC! I’m so glad I’m not the only one…my hubby’s always telling me how strange it is not to like Maple syrup. Oh, well – he’s crazy to not love chocolate! I’ll definitely be back next week 😀 Hope your weekend is wonderful! I love French toast… Great twist on a favorite! I’ve never heard of anyone who didn’t like maple syrup – LOL! I am a maple syrup lover myself. 🙂 Sounds delicious! That’s my kids….if I put maple syrup on ANYTHING, they will eat it! My youngest even licks it off the plate. I don’t get it, but it works 😀 Hope you have a fabulous weekend! I love maple syrup, but I’m just not a french toast person! But I do love filling every hole on a waffle with syrup!! I’ve noticed that most people LOVE maples syrup…it’s not a like it type thing…just love or hate. Kind of fun! If you love it, then definitely enjoy it as much as possible with your waffles 😀 Thanks so much for stopping by! Welcome, Angela!!! Thank you so much for coming by….hope to see you more! Now that it’s almost the weekend….hope you have a fantastic-tastic weekend! Thanks Emily! That weekend was great, thank you! (I’m a bit behind with comments, sorry) 😉 Hope this coming weekend is just fantastic for you! I saw that on there and it TOTALLY made my day!!! Thank you so much 🙂 Proudly displaying the button! Can’t wait for the next party. Hope you have a marvelous weekend! Thanks so much, I LOVE your parties! I make sure to link up every week 😀 I hope you have a FANTASTIC weekend! Looks yummy for breakfast and simple. Thank you for sharing. Saw these on Show Me Your Plaid Monday. They look so yummy! I will be pinning and trying these very soon for my Pinterest review blog! Wonderful! Please let me know what you think of them 🙂 Hope your weekend if absolutely splendid! Thank you so much for linking up with me this week at Tasty Tuesdays! I’ve pinned this & shared it with my followers!